Of the 2,000 applicants, 39 semi-finalists were invited to attend Jury Day in Madrid on March 1st. Startups pitched in front of a jury of experts, and 14 were selected to enter the program. 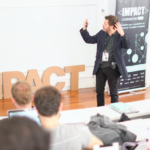 IMPACT Growth’s second Jury Day took place in Madrid on Thursday, March 1st as the final step in the selection process which began in September. 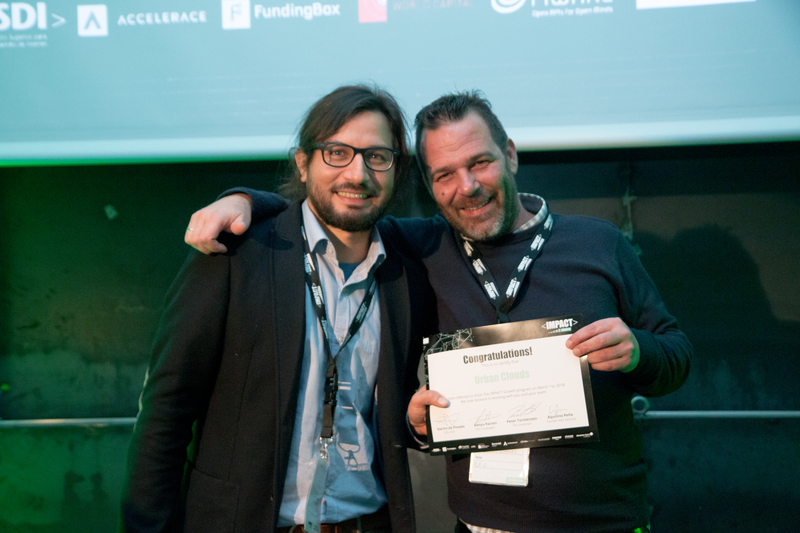 Thirty-nine startups from all over Europe and the world attended this all-day event, which culminated in the selection of 14 startups to enter the program and get up to €250,000 equity free along with premium acceleration. The day kicked off with a welcome from Nacho de Pinedo, CEO of ISDI, and Peter Torstensen, CEO of Accelerace. Following this, the startups pitched in front of a panel of renowned experts from IMPACT Growth partner ISDI, FundingBox, Accelerace, Kibo Ventures, DOCOMO Digital, MADE, Danone, and Ferrovial Servicios. The day included an inspirational fireside chat from entrepreneur Brian Wong, and ended with the announcement of the selected startups and a celebration. The second IMPACT Growth open call was launched on September 5th. By the time the application period closed on December 12th, 2017, a record-breaking number of 2,025 startups from over 60 different countries had applied. Startups applied within one of the program’s four verticals: Smart Content, Smart Infrastructure and Cities, Smart AgriFood and Smart Content. The 39 invited startups pitched in front of one of two panels of renowned professionals in the business and technology sectors, who judged these companies based on criteria such as scalability and international growth. The juries were comprised of distinguished experts coming from ISDI and FundingBox, two of the companies leading the startup accelerator, as well as top accelerators, venture capital entities and global brands partnering with IMPACT Growth. Jurors included Nacho de Pinedo and Jorge Villabona from ISDI; Lars Brøndum Petersen and Tomasz Mazuryk from FundingBox; Peter Torstensen and Søren Lottrup from Accelerace; Jordi Vidal and Joaquín Revuelta from Kibo Ventures; Simona Torre from DOCOMO Digital; Merete Nørby from MADE; Carlos Bosch from Danone; and Carolina García and Francisco Javier Luque Cañones from Ferrovial Servicios. External advisors to the jury included Pedro Jareño of Microsoft, Borja Breña Lajas of Curve Ventures, Michał Wrzołek of MCI, and tech entrepreneur Eduardo Fernández Riveira. 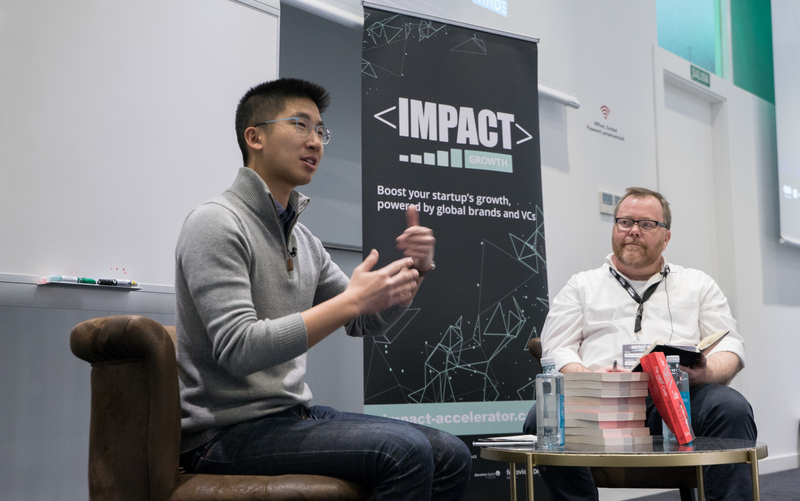 Featured speaker Brian Wong participates in a fireside chat with Martin Holm Mortensen of Accelerace. IMPACT Growth is focused on four verticals, each of which is led by a corporate partner. Absolute Zero, ArtuData, and Chatnfly have been selected under the Smart Content vertical, led by DOCOMO Digital. In the Smart Cities and Infrastructures category, supported by Ferrovial Servicios, the selected startups are e-bot7 GmbH, Fueloyal, SENSEI, and SMAQ. For the Smart Agrifood division, led by Danone, the chosen startups are Digitanimal, Pycno, and Skyx. Finally, Freesense, Maturix, VISTRA, and WiTraC are the selected startups in Smart Manufacturing, partnered with MADE. Absolute Zero (Denmark) – Interactive 360° live streaming enabled through self-aware VR cameras and augmented reality. ArtuData (UK) – Use Artificial Intelligence to find, attract and retain your high value clients. Chatnfly (Spain) – 100% automated travel chatbot for end users and corporates. Available on WhatsApp, Facebook, Telegram and SMS. In English and Spanish. 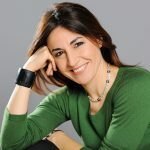 Digitanimal (Spain) – Digitanimal is a solution that increases livestock farms profits; ensuring animal welfare and traceability to consumers using blockchain. e-bot7 (Germany) – We supercharge your customer service through the integration of artificial intelligence. Freesense (Denmark) – Wireless, free floating sensor particles for production optimisation in stirred bioreactors. Fueloyal (Bulgaria) – Smart IoT Platform for fleet efficiency. Maturix (Denmark) – Intelligent wireless industrial monitoring of concrete production. Pycno (Spain) – The one and only stop for Precision Agriculture. SENSEI (Portugal) – Sensei is an AI-powered real-time video recognition solution for retail providing accurate in-store analytics and insights. Skyx (Israel) – Autonomous and modular swarm of agriculture spraying robots. SMAQ (Spain) – Spatial Mapping of Air Quality. VISTRA (Denmark) – Automated Knowledge sharing: inspect, train, assist and maintain. WiTraC (Spain) – WiTraC has created a wireless real time location system (RTLS) for Industry 4. 0 based on Internet of Things and Smart Sensors. What does IMPACT Growth offer? Funding. As in the first IMPACT Growth open call, in addition to the initial funding of €100,000 per startup, two of the selected startups will be granted a further €150,000 equity free each. 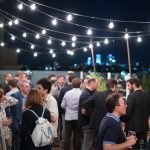 Participants will also have the possibility of obtaining additional funding through partner Invesdor’s crowdfunding platform, as well as private financing of up to €1.5 million from the European venture capital Kibo Ventures and the European leading accelerator Accelerace, both IMPACT Growth partners. Acceleration. Startups will participate in an intensive, three-month acceleration program, led by ISDI and Accelerace, which uses the Open Acceleration model of high-performance and data-driven training to kick the startups’ growth to the next level. FIWARE. Selected participants will receive guidance and technological support from the FIWARE Foundation for the integration of this open-source technology into their projects. The IMPACT Growth program will thus include specialized FIWARE training featuring renowned experts from all over the world and entrepreneurs in Madrid, Copenhagen and Barcelona. Mentoring. Startups will gain access to IMPACT Growth’s international network of over 100 founders and investors. Each startup will be paired with a custom-matched mentor. IMPACT Growth’s mentors are top-level experts from companies such as Google, Airbnb, Booking.com, and MIT. Events. Selected startups will be invited to participate in a range of international events organized over the course of the year by 4YFN, the business platform for the growing community of technology startups at the global level supported by Mobile World Capital Barcelona (MWCapital). Corporate pilots. Finally, startups have the opportunity to develop pilot programs with IMPACT Growth’s four corporate partners: Danone, DOCOMO Digital, MADE, and Ferrovial Servicios. This is the second and final batch of IMPACT Growth startups. In the first open call, 14 top European startups were selected to participate in the program from among 1,900 applicants. Having finalized the three-month intensive acceleration phase, these startups are now ready to enter their internationalization process offered by IMPACT. 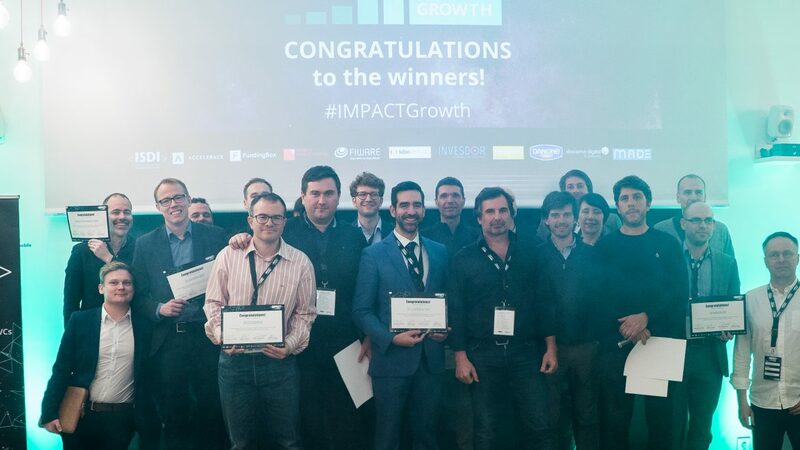 Three of the most outstanding startups of the first batch of IMPACT Growth were chosen to travel to Silicon Valley along with two members of the IMPACT team in February. Later this month, four top startups, selected among the 14 first open call winners, will embark on the second IMPACT Growth Digital Mission, which will take place in London. A happy startup shows off their diploma after being selected for the program. The acceleration process, led by ISDI and Accelerace, will officially launch in April with an intensive training camp. Over the course of the training camp, selected startups will participate in diverse training activities, including lectures and workshops led by expert speakers and professors. Training will also include social activities to encourage attendees to network with mentors, consortium partners, and other startup members. This will be one of the few cases in which members of the selected startups are required to be onsite. The majority of the acceleration process is delocalized, meaning startup team members will be able to work remotely with IMPACT’s network of international mentors. This means startups can take part in an international program while continuing to strengthen their home ecosystems. IMPACT Growth is an initiative funded by the European Commission’s Horizon 2020 programme, under grant agreement No 732480, with a total of €3.6 million for its initial phase.